Home > Google News > Google Maps > Google & Bing Block Out 66 16 0 N 179 15 0 E On Google Maps, Why? Google & Bing Block Out 66 16 0 N 179 15 0 E On Google Maps, Why? Go to 66 16 0 N 179 15 0 E on Google Maps or Bing Maps and you will see a blurred out area. 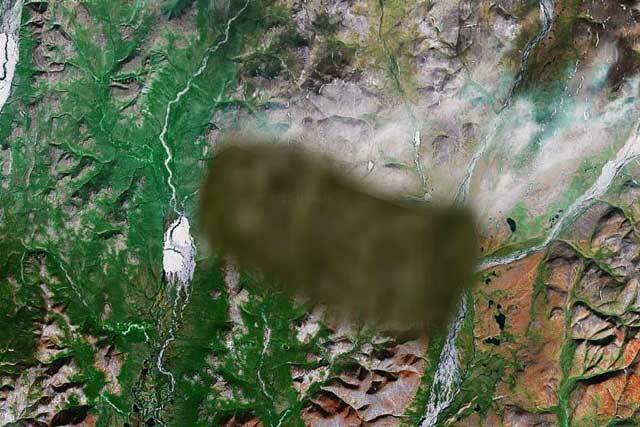 No one knows exactly why that area in Russia is blurred out. It is one of the few blurred out areas on Google Maps. A Google Maps user asked why on the Google Maps Help forum, but I doubt we will see a reply. There is some discussion on this at Unexplained Mysteries Forum but no one knows the full truth. Maybe it is a military base, maybe aliens live there, or maybe it is the RustyBrick headquarters (okay not). It is interesting to see this, since street views came to Russia this week. I have been wondering about this for a long time. On ALL of the map sites, this area in Russia is photoshopped or blurred: 66 16 0 N 179 15 0 E. Nobody seems to have any answers and I am going nuts wondering what is being hidden from us all. Can anyone tell me what the significance of this area is and why we aren't allowed to see it?